(Nanowerk Spotlight) Americans suffer between five to six million bone fractures every year, 10% of which are so complicated that surgeons need to perform nearly half a million bone graft operations. Bone grafts are second only to blood transfusions on the list of transplanted materials. With bone grafts, a surgeon replaces missing bone with material from the patient's own body, or a synthetic or natural substitute. Traditional tissue repair techniques, especially with synthetic materials, may lead to poor integration with the existing bone or tissue structure, potentially transfers dangerous pathogens into the body, and sometimes lead to a complete rejection of the graft. To minimize these harmful side effects, researchers are developing sophisticated tissue engineering techniques based on the construction of three-dimensional scaffolds out of biomaterials to provide mechanical support and guide cell growth into new tissues or organs (see: One day doctors will grow new bones with nanotechnology). In the quest to make bone, joint and tooth implants almost as good as nature's own version, scientists are turning to nanotechnology. They have found that the response of host organisms – including at the protein and cellular level – to nanomaterials is different than that observed with conventional materials. The surface nano-characteristics of biomaterials are increasingly recognized as crucial factors with regard to tissue acceptance and cell behaviors. While this new field of nanomedical implants is in its very early stage, it holds the promise of novel and improved implant materials. An ideal tissue scaffold should have hierarchical porous structures comparable to that of human bone. Not only does this require three-dimensional (3D) macroporous structures on the micro- or millimeter scale to facilitate transport of nutrients and tissue ingrowth, but also surface features on the nanometer scale to improve the conformation of typical adhesive proteins and accelerate cell attachment and proliferation. "It is increasingly being recognized that the surface characteristics of biomaterials such as chemical composition, topography, and roughness are crucial factors with regard to tissue acceptance and cell behaviors, and ideal tissue scaffolds should have hierarchical porous structures" Dr. Paul K. Chu explains to Nanowerk. Chu is Professor (Chair) of Materials Engineering in the Department of Physics & Materials Science at the City University of Hong Kong and head of the university's Plasma Laboratory. Together with his group and collaborators from HubeiUniversity in Wuhan, Southeast University in Nanjing, PR China, and The University of Hong Kong, he now reports the large-scale direct growth of nanostructured bioactive titanates on a 3D microporous orthopedic NiTi/Ti scaffold with complex topographies. Due to their high biocompatibility, titanium-based biometals are very popular for orthopedic implants. Especially the shape memory alloy nickel titanium (NiTi) is a promising candidate for quick repair or substitution of bone or hard tissues. 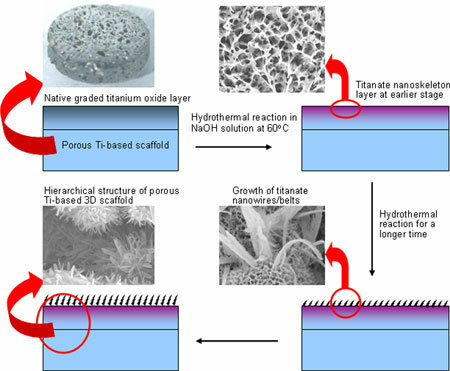 What Chu and his team have now demonstrated, for the first time, is that they can treat the entire exposed surface of 3D complex-shaped microporous titanium-based biometal scaffolds via a facile low temperature hydrothermal process to achieve a hierarchical structure on the nano- and microscale, closely resembling the natural organization of human bone. The scientists reported their findings in the October 25, 2008 online edition of Nano Letters ("A Biomimetic Hierarchical Scaffold: Natural Growth of Nanotitanates on Three-Dimensional Microporous Ti-Based Metals"). Chu explains that most of the scaffolding techniques reported so far can only be used to fabricate nano/micro porous structures on planar materials with simple topographies for tissue engineering. "Our materials are different from hybrid composites as they are filled with a layer of self-assembled organic nanomatrix" he says. "Natural growth directly from the substrate strengthens bonding between the scaffold and the nanowires and nanobelts that grow on the scaffold, favoring the formation of a smooth junction between the bone tissue and scaffold and benefiting the long-term fixation of this 3D scaffold." 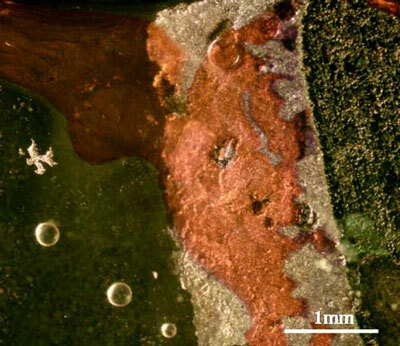 One of the outstanding features of this material is that its surface displays superhydrophilicity which, in contrast to other biodegradable polymer scaffolds that due to their hydrophobic nature have to undergo surface modification, favors deposition of hydroxyapatite and accelerates cell attachment and proliferation. The above figure schematically illustrates the fabrication process of Chu's hierarchical 3D porous scaffold. He explains the process: "We immersed 3D porous titanium-based scaffolds in a sodium hydroxide aqueous solution inside a Teflon-lined autoclave. During the heating process, a layer of titanate nanoskeleton forms on the exposed surface in the early stage via the reaction between native titanium oxides and sodium hydroxide. As time elapses, some titanate nanobelts and nanowires nucleate and grow on the skeleton, and finally, a hierarchical titanium-based metal scaffold is formed." Chu points out that the big advantage of his team's hydrothermal method is that the alkaline solution can reach the entire exposed surface despite the complex topographies of 3D porous scaffolds due to the non-line-of-sight nature. Another significant benefit of this technique appears to be that the hierarchical scaffold has no distinct interface between substrate and nanostructured layer. Chu's says that this is different from hybrid composites filled with a layer of organic nanomatrix by self-assembly because natural growth directly from the substrate strengthens bonding between the scaffold and nanowires/nanobelts, favoring the formation of a smooth junction between the bone tissue and scaffold and benefiting the long-term fixation of this 3D scaffold. "The remarkable simplicity of our non-line-of-sight process makes it widely accessible as an enabling technique for applications in materials engineering, including energy-absorption materials and pollution-treatment materials, to biotechnology" says Chu. The Chinese research team is now looking in two specific areas to improve their technique: (1) how to precisely control the growth direction, nano sizes, and different nano shapes of the surface nanostructured layer as well as bonding strength, and (2) investigate the subsequent effects on protein adhesion behavior, cell growth, and proliferation. Chu says that a particular challenge is to fully understand the action mechanisms that take place at the nanoscale and to subsequently promote the positive functions and avoid the negative, unknown and potentially poisonous effects of these novel materials on the human body.